President of Ukraine Petro Poroshenko has signed Law No. 2167-VIII "On creation of necessary conditions for peaceful settlement of the situation in certain regions of Donetsk and Luhansk regions." This was reported on Saturday by the press service of the Ukrainian president. As reported, the document stipulates that the procedures will only take effect "after all conditions stated in Article 10 of the law [on special local self-governance procedures] are fulfilled, specifically as regards the withdrawal from the territory of Ukraine of all illegal armed formations, their military equipment, and militants and mercenaries." 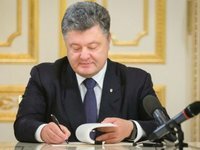 The presidential press service said that this law also determines that Ukraine in its strive to restore territorial integrity remains committed to a peaceful settlement of the situation in certain regions of the Donetsk and Luhansk regions on the basis of the principles and norms of international law and the UN Charter. The law also says that Ukraine's sovereignty extends over its entire territory, which, within the internationally recognized border, is integral and inviolable. "The law also provides the necessary preconditions for deploying a UN peacekeeping operation in certain districts of the Donetsk and Luhansk regions, particularly taking into account the Ukrainian Verkhovna Rada's resolution No. 253-VII dated March 17, 2015 'On approving Ukraine's addressees to the Security Council of the United Nations and the Council of the European Union regarding the deployment of an international peacekeeping operation in Ukrainian territory," it said. It was reported earlier that the Ukrainian Verkhovna Rada on October 6 had passed the legislation extending the law on special self-government procedures in certain districts of the Donetsk and Luhansk regions by one year. The law was to expire on October 18, 2017. The bill 'On providing essential preconditions for a peaceful settlement of the situation in certain districts of the Donetsk and Luhansk regions' was supported by 229 parliamentarians. "The responsible voting by a majority will help our army to minimize the number of casualties in holding the defense, and diplomats to increase international pressure on Russia," Poroshenko said in a video address in commenting on the legislation.